October is usually the month for a big garden tidy up. The problem is that all the wild creatures that I’ve worked so hard to attract into our garden this year actually live here. They don’t just visit for the summer! Beetles, caterpillars and hedgehogs hide in piles of fallen leaves, insects find homes in hollow stems or seed heads and newts and toads need undisturbed dry areas too. All of them depend on us for their home. Imagine being homeless all winter. It’s cold and wet and windy. Yuk! • Leave some fallen leaves and twigs under the hedge to provide shelter. • Cut back and tidy the front of the borders leaving the central area with seed heads undisturbed over winter. • Leave some areas of long grass for shelter. • Make a small pile of stones, twigs, bark and leaves to create a lovely dry home for toads, newts and small mammals. • Leave a group of empty plant pots in a quiet corner. That’s it. That’s all it takes. 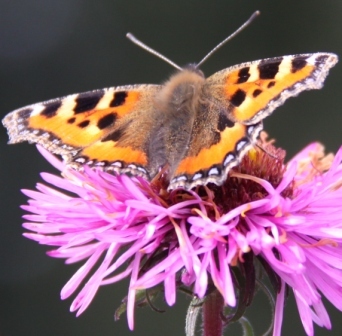 Hopefully all our beautiful wild creatures will be able to spend the winter hiding in nice quiet dry places in the garden and next spring they will reappear to delight us all over again.